At the end of January we met with Malcolm Iredale, and his wife Gill (and their dogs), of the multi-award winning Carrock Design & Build as they were preparing to launch an exciting new division of the company, Carrock Homes. Since then we’re fortunate enough to have been involved in creating the online identity for this new aspect of the business. Carrock Design & Build have been lovingly restoring the Lake District’s finest Lakeland properties since 2004 and have, over the years, earned themselves an enviable reputation for blending traditional materials and techniques with more modern styles. Having honed their skills and built up the business renovating old properties Carrock were commissioned to build a brand new property which, impressively, went on to win Best New Home in the UK 2015. Following this seal of approval Carrock Homes was born to design and build beautiful architecture from the ground up. Icold Close is the first entirely new multi-plot development and offers buyers a chance to own one of four bespoke new builds. Malcolm needed an online platform that they could use to sell the plots, ideally sooner rather than later as the buyers will gain the opportunity to customise their properties with a degree of flexibility if they’re involved early enough in the process. We addressed the brief and created a four page brochure site to clearly reflect what exactly it is that a Carrock Home offers a potential buyer. For this particular business a conversion would be having someone get in touch for further information so we used clear calls to action throughout. 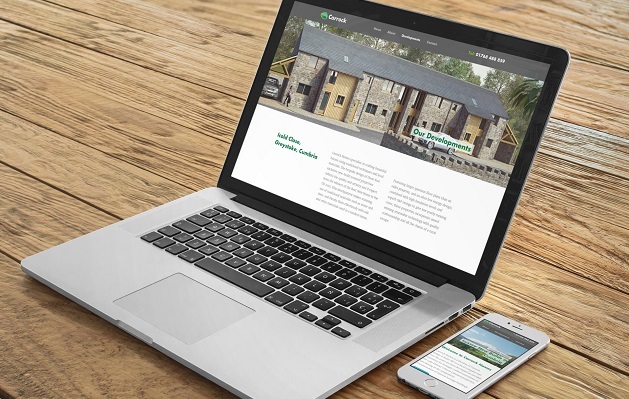 We offered a copywriting service to ease the workload for the Carrock team at a busy time, and have populated the site with information about Carrock as a business, and about the development itself, and highlighting the appeal of living in the Lake District. We also put Malcolm in touch with Revolution Viewing who have created a CGI image of how the plot will look once it’s completed. We’ve featured this image across the site to appeal to prospective buyers. We’ve enjoyed the process of working with Malcolm and Gill on this project and we’re now moving on to redesigning the bigger Carrock Design & Build site so stay tuned for that project as it progresses. If you’re interested in a property, or just fancy checking out the Carrock Homes website, you can visit the site here. If you’d like us to work on the digital aspect of your business venture, old or new, then drop us a line on 0191 228 9444 or info@unionroom.com.